World No. 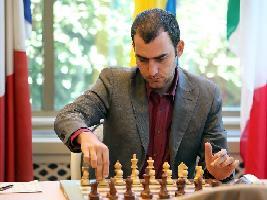 1 Magnus Carlen had not lost a game since September, 2012. What were the chances that he would lose two games with White within a span of three rounds? 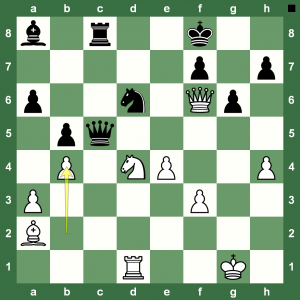 That “statistically almost-impossible” event happened in the last round (14th) of the Fide Chess Candidates 2013 in London on Monday. Magnus Carlsen got into time trouble, botched a seemingly balanced position and Peter Svidler kept his cool to take home a fine victory. 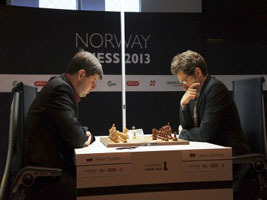 Earlier, Carlsen had lost his game with White to Vassily Ivanchuk in the 12th round. 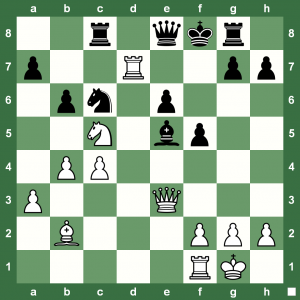 Read a full report in Chess Blog and replay the game with Chess King. 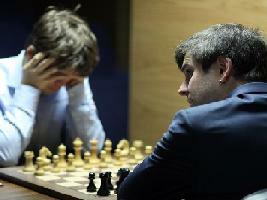 Tashkent Chess Grand Prix Peter Svidler-Alexander Morozevich: Even Draw Can be Exciting! 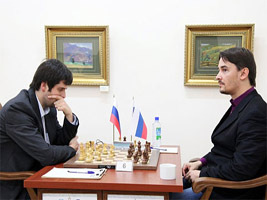 This game was played at the recently-concluded Tashkent Chess Grand Prix between Peter Svidler and Alexander Morozevich. 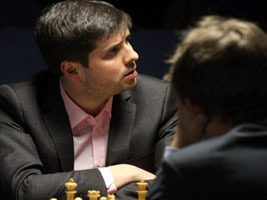 Peter Svidler tweeted about it: “At least finally there was something to watch on my board. 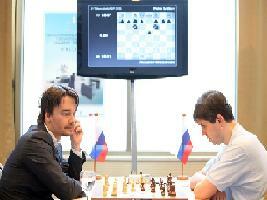 Games vs Alexander Morozevich tend to get watchable at some point, as a rule”. Indeed, it is a spectacular draw. 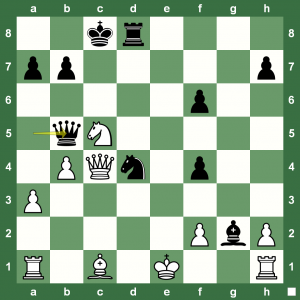 Watch the game in the Chess King applet. Have you started your own training with Chess King yet? 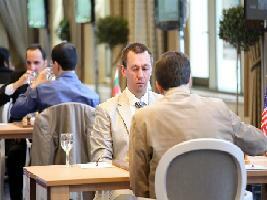 Read the event report at Chess Blog. How can Black win this? 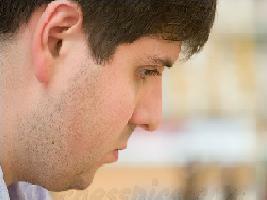 Despite computers becoming the strongest chess players on the planet and despite top-level chess impossible without computer-aided chess training, the human element in chess tournaments would never go away. Best of grandmasters miss the easiest of wins. 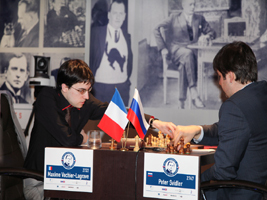 Here is an interesting position from the Russian Chess Superfinal 2012. Nikita Vitiugov missed a winning line with 26. …Qa5 27.b4 Qxb5. We pick up the game if the winning line were played. 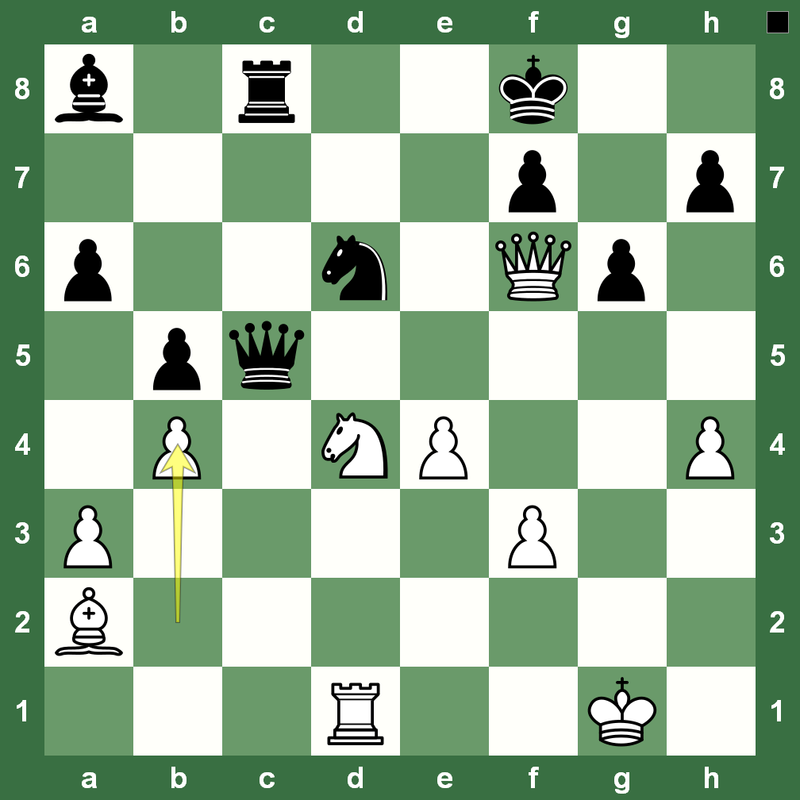 Look at the position on the left and can you spot the pretty mate that happens if White plays 28.QxQ? This game of Round 8 eventually ended in a draw. 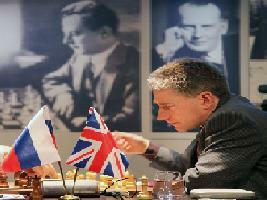 Check out www.chesspics.com for portraits of the world's top grandmasters! 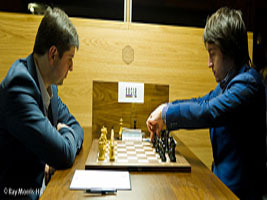 The World Rapid Chess Championship 2012 that was held in Astana, Kazakhstan saw a strong performance by Russia’s Sergey Karjakin to win the title ahead of some of the world’s strongest grandmasters. 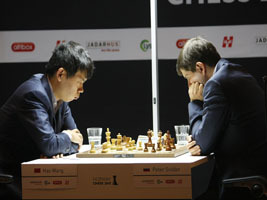 An important game that allowed Karjakin to get ahead of Magnus Carlsen was the won against Peter Svidler on the final day. 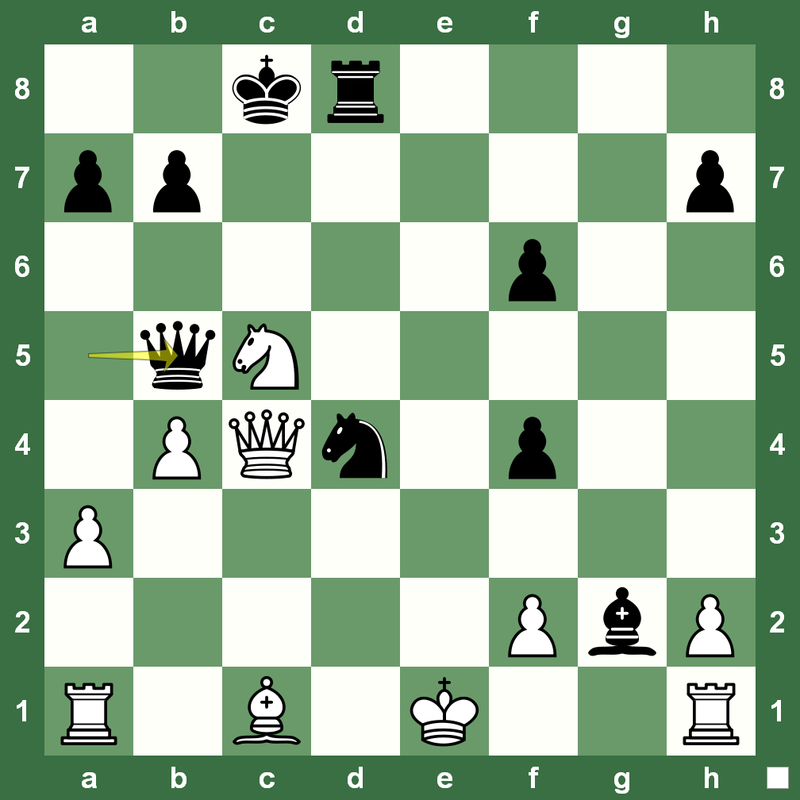 Going for a simple combination, Karjakin first wins a pawn and then builds on the small advantage. 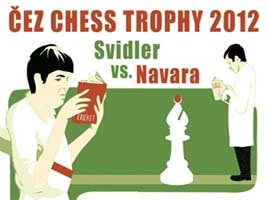 The traditional Čez Chess Trophy is being held in Prague with David Navara facing Peter Svidler – the Russian grandmaster and World Cup 2011 winner. Every year Czech Republic’s strongest grandmaster David Navara gets the opportunity to gain more experience by playing a match against a world class player. 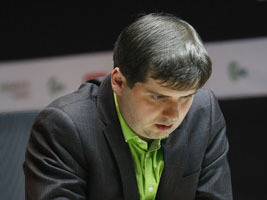 Former opponents include Vassily Ivanchuk, Vladimir Kramnik and Judit Polgar, and this year Navara faces the winner of the World Cup 2011 and 6-times Russian champion Peter Svidler. 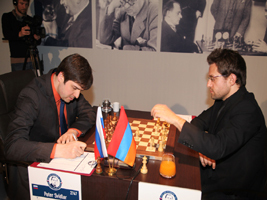 The duo drew their first game, but Navara lost to Svidler thanks (rather no thanks) to a passive rook. Check out the chess game.